I do love to make crackers. I have a cracker binder. I am guessing not many people have those. I mean a cheese cracker binder. Well, there it is. I just cannot help it, I love cheese crackers. This recipe was my winner in 2012 cracker challenge. Not my best year, but the best crackers. And I keep on making them again and again. Cream butter and Parmesan and mix well. Stir in flour, walnuts, salt, pepper, and cayenne. Form mixture to 1 inch logs and wrap in cling film. Refrigerate for at least 30 minutes or up to 3 days, or longer. Preheat oven to 350 degrees. Line a baking sheet with parchment. Cut log into 1/4 inch slices. Place slices on a baking sheet about 1 inch apart and bake for 20 minutes until edges are golden. Winner of the cheese cracker challenge. Yes, I do a cracker challenge quite often. So sad. And very geeky. But that is me. I think I’ll do it in January just for fun with a new set of recipes. Might include cheese straws for this one. Or maybe not. We shall see. How weird is it that you have a binder full (!) 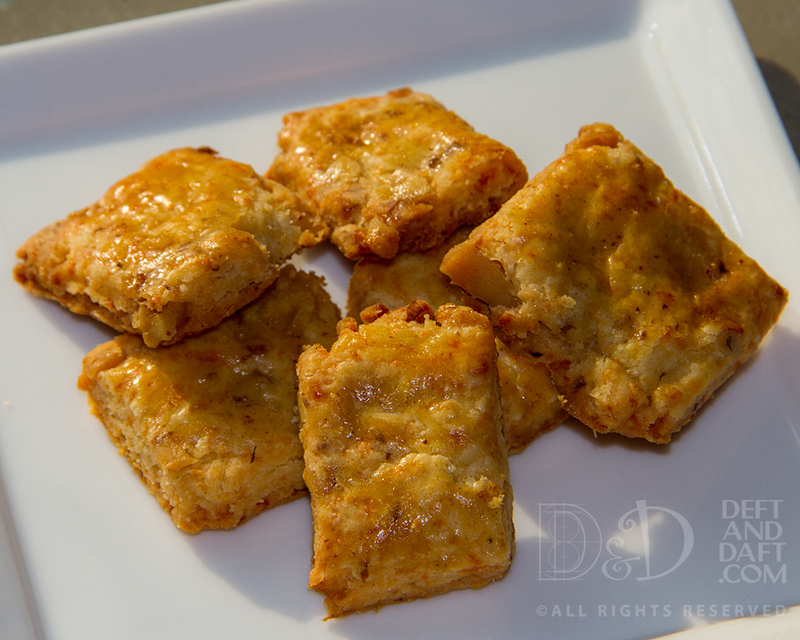 of cheese cracker recipes? Who does this? No one. Well, I do. I’m not even sure how this started really, but it did and these, as a group, are one of my favorite things to bake. I eat them for breakfast and for a snack when I get home and am making dinner. I love the fact that most of the crackers I make you can get the dough together and then bake up to a few (or more) days later. The slice and bake nature suits me for baking mid-week. 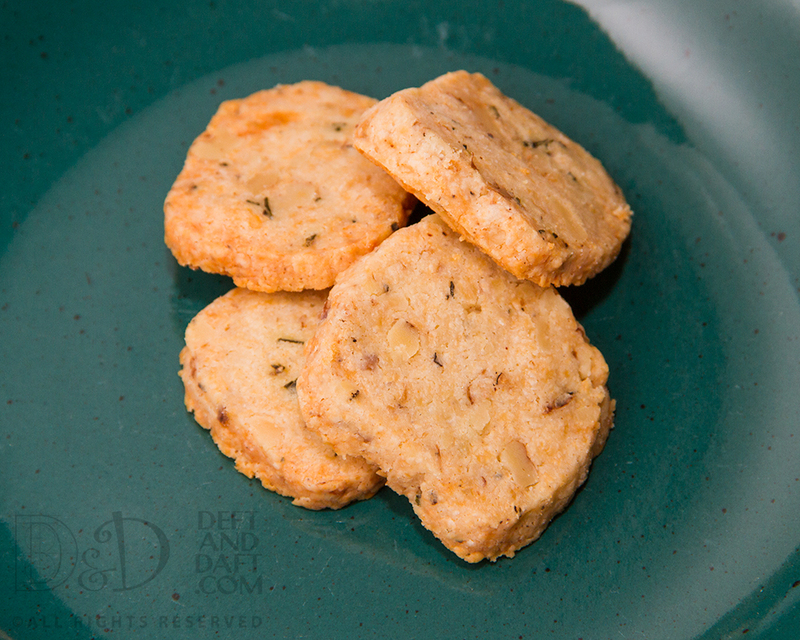 I have certain things I like about crackers: I prefer cheddar and/or Parmesan over Bleu cheese; nuts should be involved and I lean towards walnuts – pecans can be a bit sweet; my favorite herb is fresh rosemary; and there should always be bit of heat, usually provided by cayenne. I guess the only thing about crackers is that humidity will effect them (or is it affect). I was correct with the effect – thankfully. They still taste amazing, but they are a bit soft. Something that cannot be helped even this time of year. It’s early November and humid and in the 80’s. That’s our “fall” as it were. In a food processor, blend all ingredients except butter and water. Pulse five times to make sure all ingredients are mixed well. Add small pieces of butter, and pulse until pea sized dough. Add water, a tablespoon at a time until the dough just starts to hold together. Dump the dough on to waxed paper and roll into a log about 1 1/4 inch in diameter. Wrap well and refrigerate for at least two hours or up to two days (Or freeze for up to a month). Preheat oven to 325 degrees. Cut log into 1/4 inch slices and arrange slices on a baking sheet about 1 inch apart. Bake for 14 – 15 minutes, rotating pan half way through, until lightly golden. Cool on a rack. 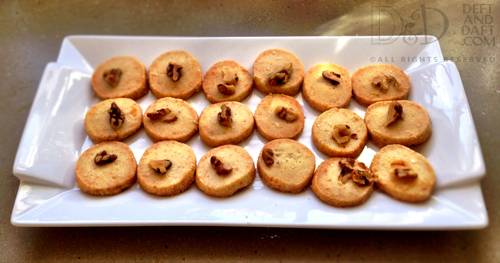 Notes: top crackers, before baking with finely chopped walnuts. I’ve had this recipe printed for about ever and in my cracker binder – yes, I have binder for cheese crackers – mock me if you dare. But I have never made this recipe until now. It uses way more butter than normal for a cheese cracker recipe, but it is super flaky. It comes together easily and then I let it sit in the fridge for several days. About a week, if I’m going to be honest, though the recipe said two days – I know from experience with cheese crackers, you can just let that slide a bit. Thankfully. I like the idea of making something one day and then bake them a bit later – that works for me. I do the same thing when pickling. Put the flour, salt, cayenne, and baking powder in a food processor. Pulse to combine. Add the butter and pulse again until the butter is in small pieces, six to eight 1-second pulses. Add the cheeses, pulse, and finally, add the egg and pulse until the mixture just starts to come together. Dump the dough on an unfloured surface. If you’re using nuts ( yes, you are), sprinkle them on the pile of dough. Knead by lightly smearing the ingredients together as you push them away from you with the heel of your hand until the dough is cohesive. Shape the dough into a flat disk, wrap in plastic, and chill for an hour or two to let the butter firm. Position racks in the top and bottom thirds of the oven. Heat the oven to 400°F. On a lightly floured surface, roll out the dough to about 1/4 inch thick. Stamp out shapes or cut shapes with a knife. Arrange 1-inch apart on two ungreased baking sheets. Reroll scraps once and stamp again. Brush with the glaze and sprinkle lightly with kosher or sea salt. Bake until golden brown and thoroughly cooked inside, about 14 minutes, rotating the sheets from front to back and top to bottom about halfway through. To test, break one in half and look to see if the center still looks doughy. If so, cook for a few more minutes, but be careful not to overbake. Let cool on a rack and store only when completely cool. *The New Food Lover’s Companion, 2001. p. 531. ** My printed version of the recipe says 1 Tbs table salt, which I thought was total over load, especially with Parmesan, so I kind of used not that much. And then I tasted the first batch with no extra salt and loved them. So that’s how I did it. And the sables are pretty much amazing. And they hold up pretty well over a week or so. Humidity didn’t seem to get to them. Nice. Not sure who Mrs. Lenkh is, but I am thankful for this recipe. Another win in the cheese cracker department. These are by far my favorite cheese crackers. The taste is divine, texture excellent, and they keep quite well. Hence winner of the cracker challenge of 2012. I honestly wonder why I make any others, but I enjoy experimenting. I have collected other recipes since then and need to stage the competition again – perhaps this year. Cream butter, add Parmesan and mix well. Stir in flour, rosemary, walnuts, salt, black pepper, and cayenne. Form the mixture into 1″ logs, wrap in plastic and refrigerate for at least an half an hour or up to three days. Preheat the oven to 350 degrees. Line baking sheet with parchment. Cut logs into 1/4 inch thick slices. Place slices on baking sheet and bake for 20 minutes or until golden at the edges. Cool on a wire rack. 7 March 2015 – just because I wanted more. Now my goal is to create one of my own and I know it will include cheddar cheese, and perhaps some Parmesan, nuts – walnuts likely, cayenne, and rosemary. Commentary: I just can’t help it. I love the way Nigella Lawson writes her recipes, “as uniform as possible without stressing over it…” That’s my idea of how to make things. It’s food. It should just be fun to do – if not, why are you bothering with it. I know it’s a cliche, but just keep it simple, really. Do love the use of the word cling film (is it a single word or not?). Turn it out onto a surface and knead for about 30 seconds until smooth, then divide into two. Take the first half and, using your hands, roll it into a cylinder, as uniform as possible without stressing over it, about 3cm / 1¼ inches in diameter. Make sure the ends are flat, too, so that the cylinder resembles a roll of coins. Now roll this up in a piece of clingfilm, twisting the clingfilm at the ends, like a Christmas cracker, and put the roll in the fridge, then proceed in the same way with the remaining half of the dough. 1 cm / ½ inch thick. Arrange on a baking sheet lined with baking parchment, and put in the oven for 15–20 minutes, when they should be just beginning to turn a pale gold at the edges. Notes: I think this recipe needed a little salt, perhaps just before the go in the oven – a little Maldon wouldn’t be misplaced. I’m a bit of a cheese cracker nut and did a total nerdy “cracker challenge” in 2012 and discovered that I like some nuts in my cheese crackers, so I put a bit of pecan on these. I think it made them a bit “prettier” or something like that. When I do them again, some cayenne will be involved. That said, they went over very well as I made them. And they looked pretty damn good.